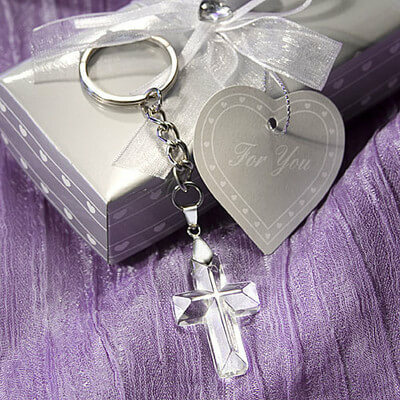 These shimmering Crystal cross keyring bomboniere Favours In Beautiful Silver Box truly shine for any religious occasion. Give your guests a wonderful remembrance of a beautiful day with these useful and elegant crystal cross keyring bomboniere. Each crystal cross keyring bomboniere measures 9.5cm x 2.5cm x 0.7cm and features a radiant, multifaceted luminous cross charm attached at its top to a sturdy chrome chain and ring. Surrounded by satin inside a silver signature heart design box, tied with an organza and satin bow with a heart on top and an attached matching heart shaped “For You” tag, these favours make for a stunning presentation. Good Morning, I would like to thank you for my package. I received it yesterday afternoon and I am very satisfied with my purchase. The postage was amazingly fast and I am grateful because I was stressing that they have taken a few weeks. Overall I am extremely happy your service and will be recommending you to others in the future. Thank you.